Last night was a fund raiser night for our school band. 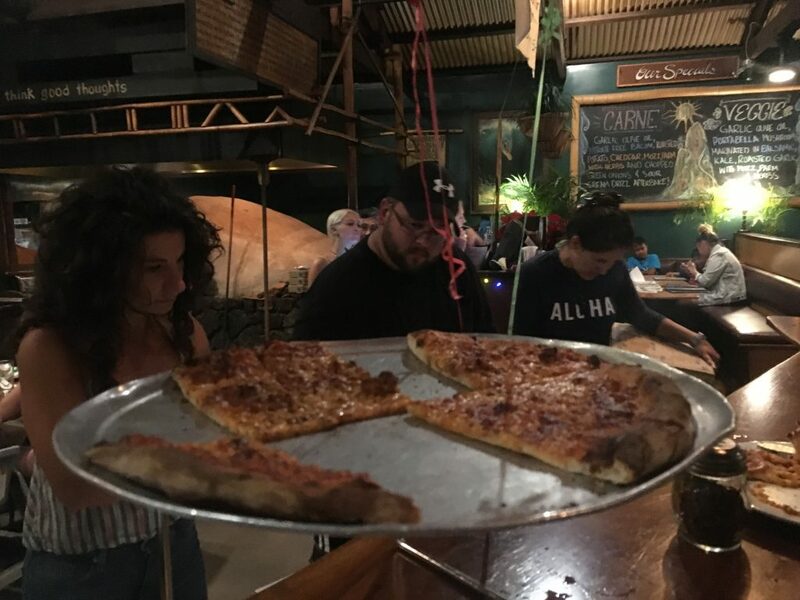 It was at a pizza restaurant in Paia. I would have supported the cause anyway, but since I’m the substitute band director while Andrea is gone, I especially wanted to be there. One of the band moms took over the organization of the evening, which included a silent auction. She is AWESOME. I’m so glad she organized things. She did a great job. I hung out with her by the auction table, and said hi to the school parents who came. It was kind of a fun change in my normal routine. Still, I was glad when the mom in charge said I should head home and get some sleep. It took me a while to see what those wires were that were suspending the pizza pan. I’d never seen that design before. Then I realized that they were balloon ribbons, and that thing piercing the pan was a shadow. It’s very early and I’m very tired. Can that mom send me to bed, too?